Heigwer, F. , Kerr, G. & Boutros, M. E-CRISP: fast CRISPR target site identification. Nat. Methods 11, 122-123 (2014). E-CRISP has been optimized using fast and accurate algorithms to design CRISPR gRNA sequences to target any nucleotide sequence ranging from single exons to entire genomes. Special emphasis in the design process has been given to usability in experimental applications. E-CRISP not only checks for target specificity of the putative designs but also assesses their genomic context (e.g. exons, transcripts, CpG islands). Organism The organism the designs should be created for. The databases are pre-built for each organism. The genome release is indicated in the dropdown menu. Target Sequence The sequence the CRISPR should be designed to target. Either enter an Ensembl ID, a gene symbol or a sequence in fasta format. If a fasta sequence is given the locus can be stated in the header in the form of "chrom:X:1..1000 ", if your sequence originates from the first 1000 bases of the X chromosome. If this location is not be stated in the header (the text after ">") the program does not check the genomic context. Design Purpose In this section, the user can specify the experimental purpose of the CRISPR. Depending on the purpose, different regions of the input sequence will be targeted. Purposes included, knock-out experiments, N-Terminal tagging, C-Terminal tagging, CRISPRi and CRISPRa. Further many more specific parameters can be tuned there. Such as favourable GC-content or PAMs. Gene annotation filtering In this section, the user can filter the output results, based on gene annotation information. For example, all results which do not target an exon can be excluded from the output, or the user can specify which exon to target. Output In this section, the user can specify what output files are produced. If the user expects a lot of CRISPR designs to be return (e.g. inputting a large number of sequences at once), the user can switch off producing an image and an html output table. A summary of the design process. A html table is returned, where each row indicates a CRISPR alignment. Name The ID of the CRISPR. This is of the form: ID of the input sequence_randomNumber_random_Numer. SAE Score S: Specificity score A: Annotation score E: Efficiency score. See the table below for more information. Target The gene that is targeted by this gRNA. 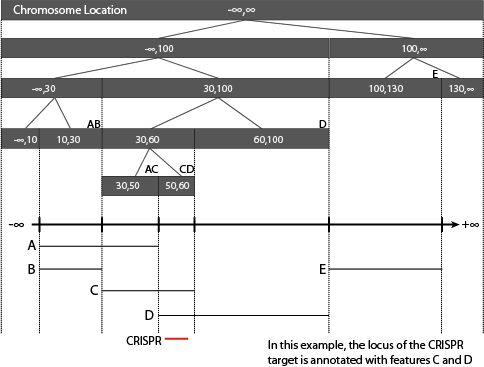 If a fasta sequence is given as input with no chromosome location information, E-CRISP cannot search the annotation databases, and no target gene will be returned. Match String A coloured match screen, which indicates at a glance how good the alignment is: A green "M" for a match. A "X" for a mismatch, an "I" for an insertion in the gRNA. Number of Hits The number of locations this CRISPR design targets, or, the number of times this CRISPR appears in the output table (one for each target). A genome browser image of the CRISPR designs in their genomic context. This allows the user to visually inspect where the CRISPR in the input sequence. Off-targets (where the CRISPR targets outside of the input sequence) are not shown in this image. Doench_Score Efficacy score as introduced by Doench et al. 2014 Nat. Biotech. Xu_score Efficacy score as introduced by Xu et al. 2015 Gen.Res. In addition the scores of Doench et al. and Xu et al. are given in the output table. Why do I have to choose the organism for my design? E-CRISP not only identifies if your input sequence has a CRISPR target site, it also annotates this site with genomic annotation information, such as which gene, transcript, exon are that the targeted site, if any. It also, check for off targets in the rest of the mRNA, transcripts or chromosomal DNA of that organism. In order to do this, you must select an organism, so that the correct genomic annotation databases and off-target databases can be searched. How does E-CRISP annotate my sequence? Every putative binding site found is annotated with its genomic context, i.e. whether it is contained within an exon, coding sequence, transcript, gene, CpG island etc. Annotation of many putative bindings sites requires an efficient search of genome annotation databases. To maximize efficiency and shorten runtime, E-CRISP uses a binary interval which stores all genome annotations for the respective organism. How does E-CRISP identify off-targets? The task of E-CRISP is to find CRISPR target sites which are specific. This means that it will only target the sequence inputted by the user, and no other sequence. E-CRISP tests for specificity by using bowtie2 to map the identified gRNA sequence to the rest of the organisms chromosomal DNA (default), gene models or mRNA. If it can map the gRNA to another sequence, it has an off-target. tolerated off-target effects: How many off-targets to return (CRISPRs with more off target than this will not be returned in the results). The default is 0. This means by default, E-CRISP will ONLY RETURN SPECIFIC hits. It will return a maximum of 30.
number of 5' mismatch positions: The number of mismatches allowed in the off-targets in first 6 bases at the 5' end of the sequence (hard clipping the sequence). The default is 0. Tolerated edit distance to the target sequence: The number of mismatches and indels allowed in the off-targets. The evaluation tool will return all off-targets of the CRISPR to be evaluated. Why do I have a choice against which sequence to check for off-targets? chromosomal DNA - use this option if you want to know if your gRNA targets anywhere else in the genome. gene models (including introns) - use this if you are only interested if your gRNA targets elsewhere in the gene-models, and targeting outside gene models is not of concern for your design. mRNA - use this if you are only interested if off-targets will effect transcribed mRNA. How do I identify if my CRISPR design has any off-targets from the output table? You must select as an input option in the "Check for off-targets" section to analyze for off-targets. The "Number of Hits" column in the output table will contain the number of targets the corresponding CRISPR has. If this number is 1, the CRISPR is specific, and has only one target. If this number is 2, the CRISPR is unspecific. That is, it targets your intended sequence and another sequence. There will be two rows in the output table for this CRISPR. If this number is 3, the CRISPR is unspecific. That is, it targets your intended sequence and two other sequence. There will be three rows in the output table for this CRISPR. What is a secondary off-target? Check if the CRISPR targets any foreign, exogenously introduced sequences. You can select from a list of commonly introduced sequences in lab, or paste in the sequence in the text area. I only get a chromosome name in the target column of the output table - why? E-CRISP can only return target information, if location information is given in the input. If a gene name/symbol is given, this location information can be retrieved from the pre-built databases. If a fasta sequence is given, the location must be given in the fasta header, in order to check for genomic context. If it is an off-target match, this match may lie outside an annotated region, in which case only the chromosome is returned. Why is the minimum/maximum guide RNA length after PAM 20? Recent publication have shown that the guide RNA target sequence might be as well shorter or longer than 20 bp. This can have influence on the binding affinity and thus the efficiency of the CRISPR construct. Where is the information about the organisms taken from? 2. All other databses were updated to the newest version available in ensembl. 4. Scoring schemes of Doench et al. and Xu et al. added to the analysis. 4. Targets can be identified in sequences which do not originate from the organism selected. 2. A new more intuitive scoring system, devided into Specificity, Annotation and Efficiency score has been implemented. 3. Three new default options have been added guiding you fastly to the most wanted results. For further details visit the help pages and scroll down to the schoring scheme. 4. Off-target checks are now much more precise, because the PAM region (NAG or NGG) now is truely ambigous. An off-target is searched without the PAM but only considered valid if any PAM is present. 26 May 2014, version 3.1 We are happy to announce a further major update to our E-CRISP web service. Many new organisms have been added together with big changes in the web front end. Hence you will find the new forum and many other new things here in the new BETA version 3.1. 14 April 2014, version 3.0.2 In this minor update different default values for de-novo sgRNA design have been implemented, allowing for more designs to be found. 20 March 2014, version 3 A new version of E-CRISP has been released (version 3.0). It includes more off-target search options and we implemented speed improvements to enable the design of sgRNAs against up to 200 genes in parallel. 1. Wang, T., Wei, J. J., Sabatini, D. M. & Lander, E. S. Genetic screens in human cells using the CRISPR-Cas9 system. Science 343, 80–4 (2014). 2. Fu, Y. et al. High-frequency off-target mutagenesis induced by CRISPR-Cas nucleases in human cells. Nat. Bio31, 1–6 (2013). 3. Malina, a. et al. Repurposing CRISPR/Cas9 for in situ functional assays. Genes Dev. 27, 2602–2614 (2013). 4. Ma, M., Ye, A. Y., Zheng, W. & Kong, L. A guide RNA sequence design platform for the CRISPR/Cas9 system for model organism genomes. Biomed Res. Int. 2013, 270805 (2013). 5. Smith, C. et al. Whole-Genome Sequencing Analysis Reveals High Specificity of CRISPR/Cas9 and TALEN-Based Genome Editing in Human iPSCs. Cell Stem Cell 15, 12–13 (2014). 6. Yu, Z. et al. Highly efficient genome modifications mediated by CRISPR/Cas9 in Drosophila. Genetics 195, 289–91 (2013). 7. Cho, S. W. et al. Analysis of off-target effects of CRISPR/Cas-derived RNA-guided endonucleases and nickases. Genome Res. (2013). 8. Shalem, O. et al. Genome-scale CRISPR-Cas9 knockout screening in human cells. Science 343, 84–7 (2014). 9. Rna, C. S. pyogenes. 12, 1–7 (2013). 10. Mali, P. et al. CAS9 transcriptional activators for target specificity screening and paired nickases for cooperative genome engineering. Nat. Biotechnol. 31, 833–8 (2013). 11. Mali, P. et al. RNA-guided human genome engineering via Cas9. Science 339, 823–6 (2013). 12. Baena-Lopez, L. A., Alexandre, C., Mitchell, A., Pasakarnis, L. & Vincent, J.-P. Accelerated homologous recombination and subsequent genome modification in Drosophila. Development (2013). 13. Hou, Z. et al. Efficient genome engineering in human pluripotent stem cells using Cas9 from Neisseria meningitidis. Proc. Natl. Acad. Sci. 1313587110– (2013). 14. Hsu, P. D. et al. DNA targeting specificity of RNA-guided Cas9 nucleases. Nat. Biotechnol. 31, 827–32 (2013). 15. Jiang, W. et al. Demonstration of CRISPR/Cas9/sgRNA-mediated targeted gene modification in Arabidopsis, tobacco, sorghum and rice. Nucleic Acids Res. 1–12 (2013). 16. Ran, F. A. et al. Double Nicking by RNA-Guided CRISPR Cas9 for Enhanced Genome Editing Specificity. Cell 154, 1380–9 (2013). 17. Tsai, S. Q. et al. Dimeric CRISPR RNA-guided FokI nucleases for highly specific genome editing. Nat. Biotechnol. (2014). 18. Carroll, D. Staying on target with CRISPR-Cas. Nat. Biotechnol. 31, 807–9 (2013). 19. Bae, S., Kweon, J., Kim, H. S. & Kim, J.-S. Microhomology-based choice of Cas9 nuclease target sites. Nat. Methods 11, 705–6 (2014). 20. J. G. Doench, E. Hartenian, D. B. Graham, Z. Tothova, M. Hegde, I. Smith, M. Sullender, B. L. Ebert, R. J. Xavier, D. E. Root, Nat. Biotechnol., 2014, DOI:10.1038/nbt.3026. 21. H. Xu, T. Xiao, C.-H. Chen, W. Li, C. Meyer, Q. Wu, D. Wu, L. Cong, F. Zhang, J. S. Liu, M. Brown, S. X. Liu, Genome Res., 2015, DOI:10.1101/gr.191452.115.